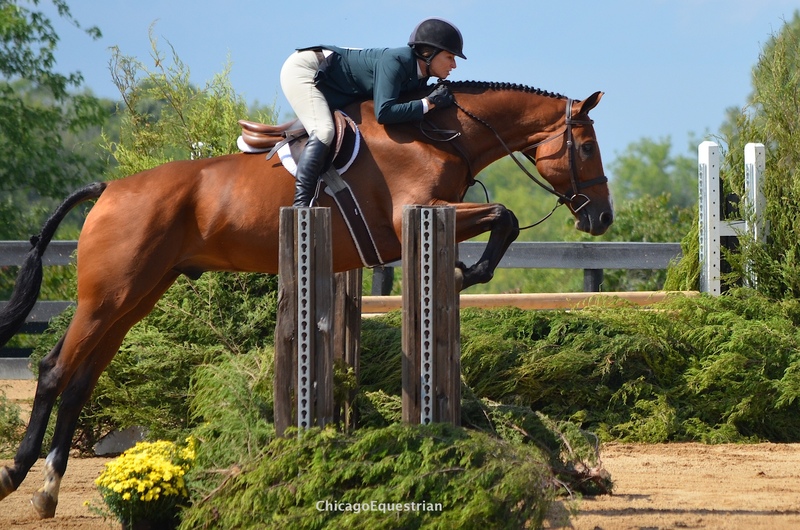 Antioch, IL – September 5, 2014 – The premier Chicago Hunter Derby at Annali-Brookwood Farm presented by Chicago Equestrians for a Cause, kicked off with the $7,500 International Derby Welcome Stake and the $2,500 National Derby Welcome Stake sponsored by Lane Change Farm and Kensel, LLC. The weekend charity event features the $50,000 USHJA International Hunter Derby sponsored by Canadian Pacific and the $5,000 National Hunter Derby sponsored by Sapphire Riding Academy in Mettawa, IL. Three charities will benefit from the event; the USHJA Foundation, University of Chicago Cancer Research Foundation and Ann and Robert H. Lurie Children’s Hospital of Chicago. Despite Mother Nature’s curveball loaded with some heavy rain, course designer Bobby Murphy and his crew moved a course off the grass field and into the sand ring for the day’s classes, saving the field for Saturday and Sunday’s events. The crew had a new course set in no time with only a slight delay in the start time. In the $7,500 International Hunter Derby Welcome Stake, it was Tammy Provost of Sheridan, IN, aboard Alliy Moyer’s Libretto who topped the field with an 87, the highest score of the day. Libretto is no stranger to the winner’s circle, the eleven-year-old warmblood gelding has earned multiple championships with Provost in the Performance Working Hunter Division and owner Moyer, has shown the horse to numerous wins in the Amateur Owner Hunter Division. Provost supports the Chicago Hunter Derby and has returned every year to show multiple horses in the two derbies. Rush Weeden and Clare Sargent's Coup de Coeur. Second and third place went to Annali-Brookwood Farm owners Rush and Caroline Weeden. Rush Weeden scored an 84 with Clare Sargent’s Coup de Coeur and Caroline was right behind with an 82 on The Spy, owned by Glory Days Farms. 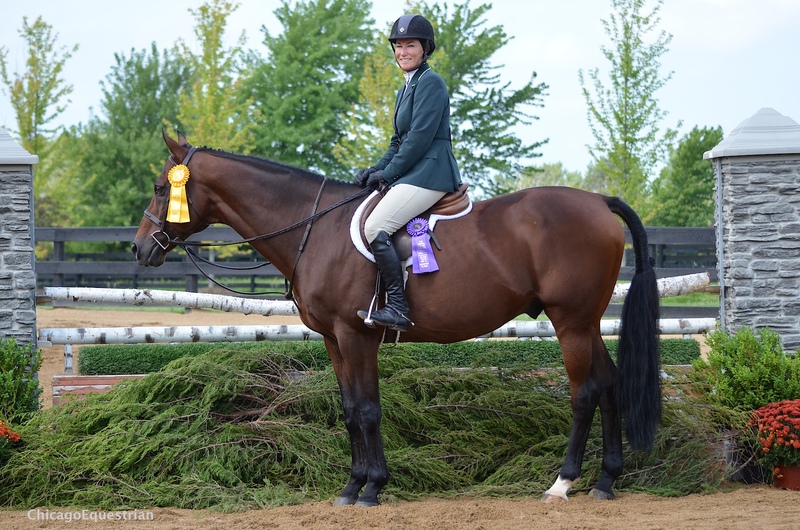 The Spy and Caroline Weeden won the USHJA International Hunter Derby recently at the Traders Point Charity Show in Zionsville, IN. Caroline Weeden and The Spy owned by Glory Days Farms. Jennifer Alfano and Me Again won the $2,500 National Derby Stake. In the $2,500 National Hunter Derby Welcome Stake, Jennifer Alfano and Helen Lenahan’s Me Again took the blue ribbon out of 41 starters. Alfano is from Buffalo, NY, and has been to the Chicago Hunter Derby almost since its inception. 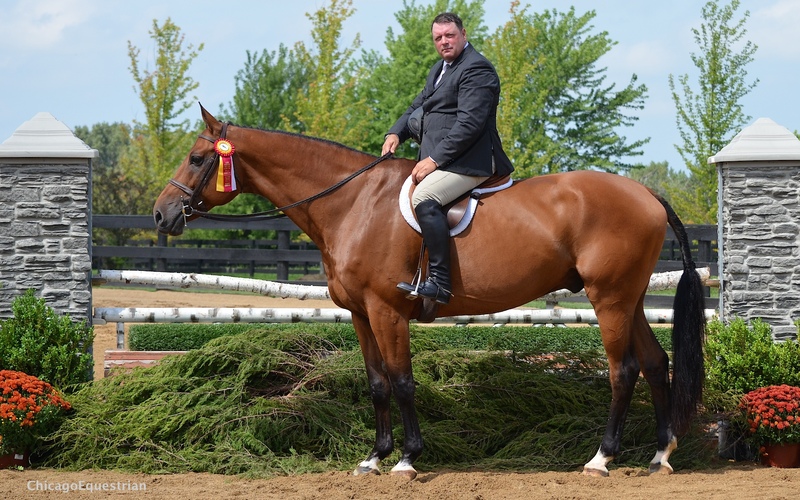 Alfano and Me Again recently won the USHJA National Hunter Derby at the Equifest horse show at Lamplight Equestrian Center and also won the Genesee Country Village & Museum’s National Derby. 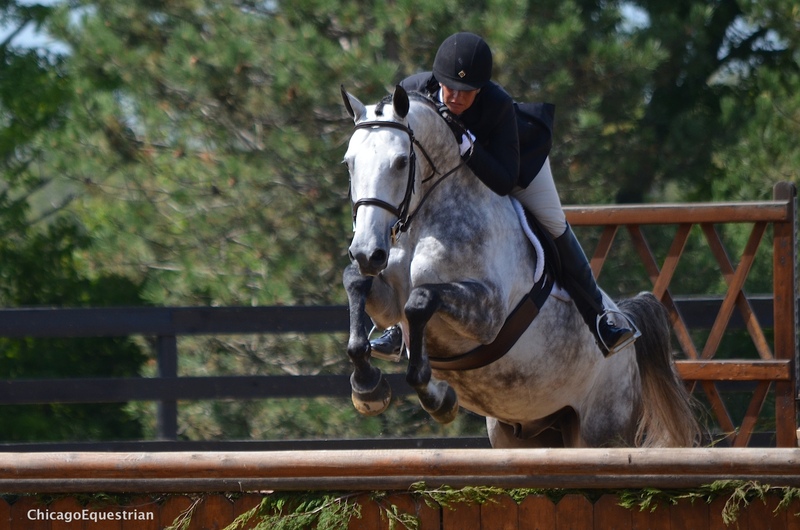 The gray warmblood gelding will just be turning six in October and already has a successful career in the Pre-Green Hunter Division. 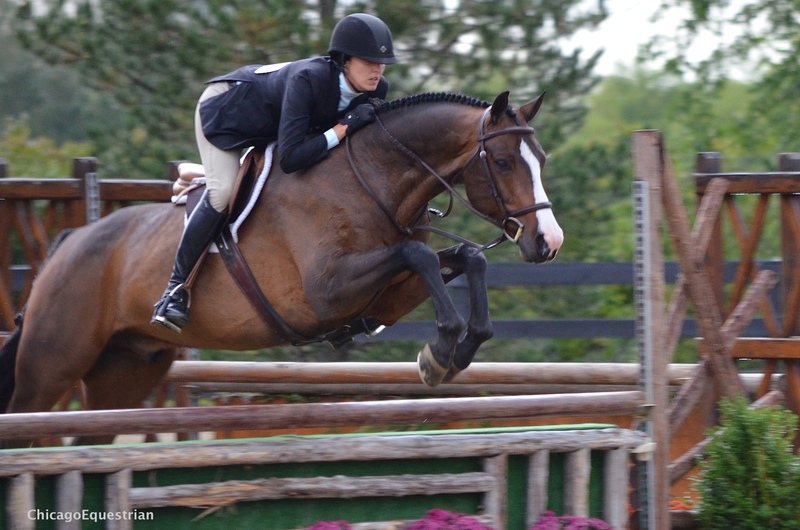 Alfano is a three-time winner of the USHJA International Hunter Derby at Annali-Brookwood Farm on her crowd-pleasing mount, Jersey Boy, owned by SBS Farm. Caroline Weeden and Amanda Williamson's Nairobi News. Second place in the National Derby Welcome Stake went to the home team of Caroline Weeden and Amanda Williamson’s Nairobi News and third went to Molly McAdow aboard Lanie Bricker’s Charlie Brown. McAdow rides for Galway Farm and Lorrie Canady in Long Grove, IL. Molly McAdow and Lanie Bricker's Charlie Brown. 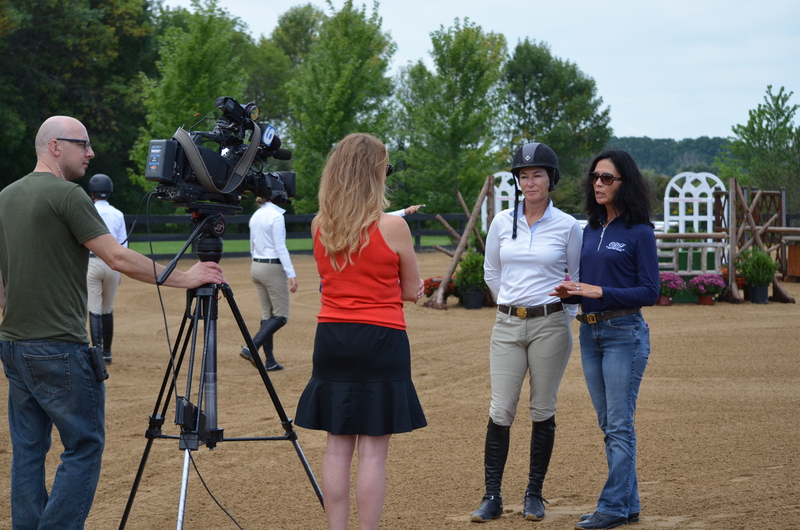 A television crew from WGN interviewed Chicago Equestrians for a Cause founders, Lynn Jayne and Caroline Weeden, along with riders Jennifer Alfano and Caitlyn Shiels, to spread the word to the public of the great charity event. Molise PR arranged for the television coverage. Lynn Jayne, Caroline Weeden and WGN. The weekend continues with the $5,000 USHJA National Hunter Derby sponsored by Sapphire Riding Academy at 2:00 pm Saturday, September 6th. Please note the time change as revisions were made due to the weather. A fantastic lunch will be served at noon and vendor row will be open for shopping. The very special Derby After Dark Party follows the conclusion of the day’s competition with the band blitzFM returning by popular demand. Admission is a suggested donation of $25. Sunday is the $50,000 International Hunter Derby sponsored by Canadian Pacific featuring a delicious Champagne Brunch at 11:00 am, a Calcutta at noon, children’s activities sponsored by Rice Dairy and the Children’s Horseless Horse Show at 11:30 am. WGN's Dina Bair will be the emcee inside the tent for the big day. The first round of the competition will begin at 8:30 am and the second round begins at 1:00 pm. In addition to fantastic raffle prizes, the Calcutta, auction and silent auction items, the Chicago Hunter Derby is holding the Score 90 Challenge, all to raise funds for the charities. For those that take on the Score 90 Challenge, a dollar amount is selected and each time a horse and rider combination gets a score from the judges of 90 or above during the competition on Saturday and Sunday, bonus money is raised for the charities. Come and enjoy the event where there is something for everyone during this prestigious equestrian competition. Tickets can be purchased at www.ChicagoEquestriansforaCause.com for Sunday’s main events. The revised time schedule is also available on the website.